All of this, at only $15 a night! 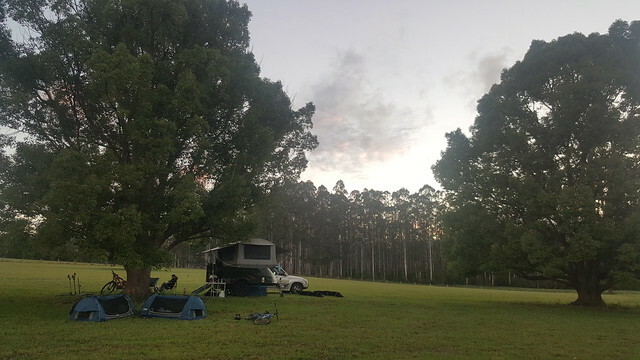 As that door closed and we went back to the drawing board, Rach found this place just north of Coffs Harbour. You needed to be completely self-sufficient (i.e. carry your own toilet, water etc) – which suited us. A quick phone call later and we were locked in for a couple of nights. 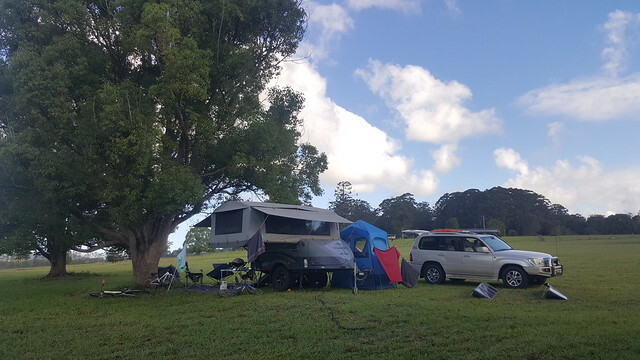 A wet drive followed our wet pack up, particularly through the endless roadworks site that is the Pacific Highway, before the skies cleared as we rolled into Coffs and out the other side – up the hill and to our latest destination. Nope, nobody over there either! A number of painted arrows directed us to a large open paddock. In the paddock there were 5 trees, and not much else. No other people and a fantastic view of the surrounding fields through the valley. This place was sensational! Not long after we arrived our host John came down to say G’day. We paid him the camping fees for our first 2 nights and told him that we would likely extend another 2 following that. Oh, the cost for those 2 nights was $30. (That’s in total, not per night.) Makes Big 4 look pretty greedy, and I know where I would rather stay any day of the week! Nor in that direction. Kids were very happy to have their swags well away from the camper. Before long we were set up, and the kids had chosen the preferred location for their swags, down around the other side of the trees. It was great to have so much space to take advantage of. The other thing we enjoyed here was the complete lack of bugs. Even if Rach and I were sitting inside the camper at night with the lights on, we didn’t need to close the door. This was beautiful. Sunday was our 11th Wedding Anniversary so we decided to head into Coffs to have a bit of a look around and find somewhere to have lunch. We ended up at the surf club which involved a pretty long wait, for a slightly disappointing meal. At least we all enjoyed the Cold Rock ice cream after lunch on the way ‘home’. I had some work to do on Monday, so Rach and the kids went to the Big Banana to play some mini golf while I sat in my makeshift office for the morning to get a few things done. They got home at 1 and after some lunch we all went down to Moonee Beach for a swim. It was a(nother) beautiful day and we got there just before low tide. There is a nice inlet here and some tidal pools to play in and learn a bit about currents at the same time. 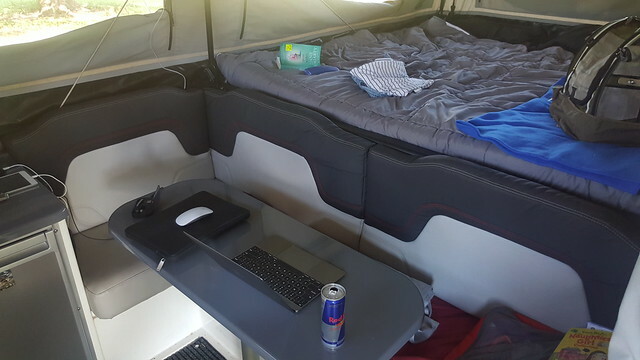 My office on the road. I could get used to working like this! While they were at the Banana Rach and the kids noticed that there was Ice Skating there as well. So Tuesday morning we headed down to the rink to be there for the first session at 10:30am. It was the first time for the kids so they were very excited and picked it up really quickly. A couple of laps doing the “wall shuffle” gave them the confidence they needed to start to venture further afield. There were also frames that they could push around which helped to get even more confidence, knowing that they could hold onto it if they lost balance. 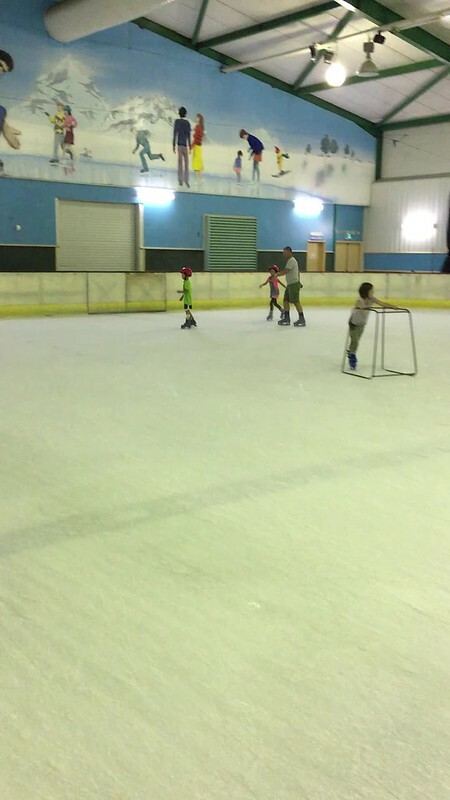 There was a holiday club group of kids there so it was pretty busy, however they left with 15 minutes to go in the session which meant that we nearly had the ice to ourselves. We had a great time at the end with the space to enjoy ourselves without worrying about being crashed into at any moment! Another afternoon was spent at the beach, we enjoyed pushing our way up against the outgoing tide before letting it carry us back down to where Rach was waiting for us. Before we knew it, our original 2 nights, plus another 2 were all but gone. 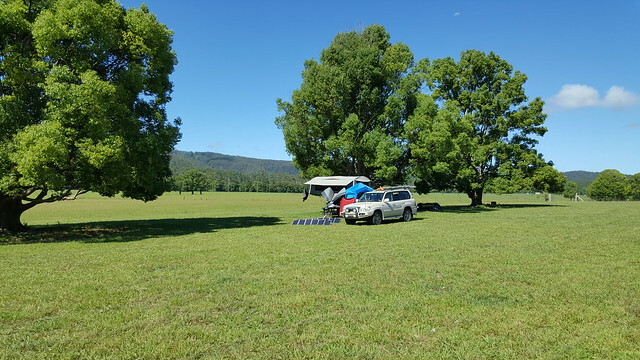 This was a fantastic camp site, and one that we hope remains as it is into the future as we will be coming back for sure. It would be great as a stop off heading further north, or, as a base to further explore the north coast of NSW.